The dictionary describes urban exploration as "the study of parts of civilization that are normally unseen or off-limits." 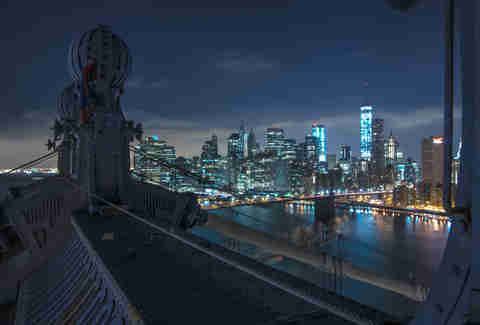 Urban explorer James Lanning describes urban exploration as ducking into an abandoned Queens hospital, perching himself atop the Williamsburg Bridge, and watching the sun rise from the Domino Sugar Factory (RIP). Routine searches of bridges by police helicopters mean a lot of running, twisting, and crouching in precarious areas. Don't trip. 2. Look Ma, no harness! 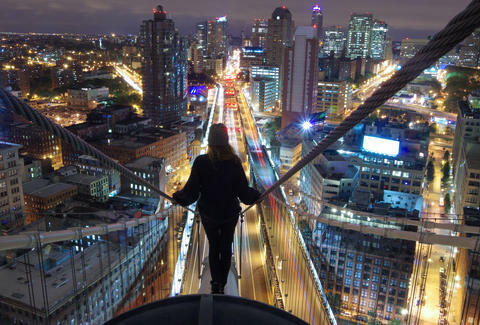 Most urban explorers don't use rope or gloves or ACME brand suction cups to scale their chosen targets. Just guts, adrenaline, and... sometimes a little headlight. It could be your Mom, your Dad, your mailman, your high school ex who now feels responsible because of the numerous times you were encouraged to climb all the way up to her bedroom window (but goddammit Julia stop making everything about you, okay?). If you climbed to the top of a building and didn't take a photo, did it really happen? Turns out: yes. Intrepid climbers have been doing this way before Instagram -- Lanning, for example, started out exploring these places without bringing a camera, but has since picked up photography skills from his exploring partner and girlfriend Lindsay (and along with them, thousands of Instagram followers). Part of the draw of social media sharing? It serves as a way to document certain spaces at a particular moment in time -- like the former graffiti haven 5 Pointz, pictured above, which is currently a huge pile of rubble atop the foundation of a future condo. Much like bacon strips and reruns of Parks and Recreation, you can't just stop after one. If you spent an entire night walking a dark subway tunnel to reach the original City Hall station, don't be surprised if you're not entirely focused during your day job. Your mind is already racing with what you want to explore next, and the spreadsheet you've been filling out at your desk hasn't made sense since row 38. Once the kevlar-clad officers realize you weren't on that bridge or hotel rooftop for nefarious purposes and were instead just taking in the view... you're still probably going to be arrested. Because you should really be paying more attention to the rumblings of the 6 train. Interestingly enough, you don't see as many rats as you'd think you would. 8. Nobody is going to tell you how they did it. Or at least, at first. And you shouldn't ask. Figuring it out yourself is part of the experience, and proving you can hack it on your own could get you admittance into a very exclusive community, sharing tips and advice with like-minded explorers. 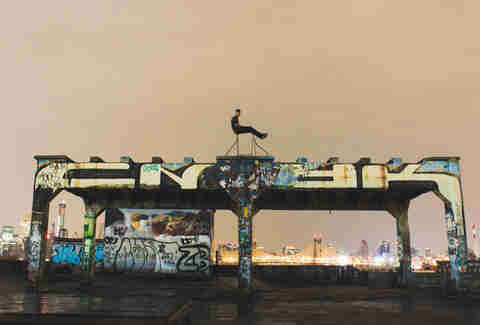 By revealing your methods, you are breaking an unwritten rule in the urban exploring community. Not only does it make the pastime harder for everyone else to enjoy, you might be indirectly responsible for someone getting hurt. Because if you can't dress like Spiderman while scaling prominent New York landmarks, when can you? Emma Diab is an Editorial Assistant at Thrillist and only Tweets about how much she hates the 7 train, so follow her on Instagram instead.